Due to some issues with 'X' upstream, booting Ubuntu from CD/USB on some graphics cards (mostly Nvidia and ATI) results in a black screen or a weird display with horizontal or vertical lines. Just as if there is no display output from the graphics card, or the resolution is not being read by the monitor. Actually, there is an output, but it is out of sync. In order to solve this, you need to pass the nomodeset boot parameter, or some other parameters listed at the end of this guide. Once you see this page, press F6 and you'll see some boot options popping up. Navigate to the "nomodeset" entry and hit Enter. You'll see a mark in the beginning. 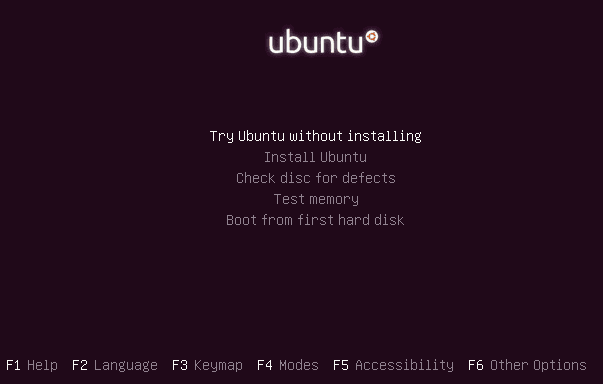 Press <Esc> and now choose "Try Ubuntu Without Installing" or "Install Ubuntu", whichever you want. Hopefully, you'll see the desktop this time. If you installed Ubuntu using the nomodeset boot parameter (or any of the alternatives listed at the end of this guide, or in some cases you didn't even use any of these parameters), when you boot Ubuntu for the first time from your hard disk, you'll encounter the same blank screen problem. From your BIOS screen just before the boot process starts, press and hold down the <Shift> key until you see the Grub menu. Highlighting the first entry there, press 'e' to edit it. Using the arrow keys, navigate to the entries "quiet splash", delete them and type "nomodeset" in their place, without quotes. (Or if you used some other boot parameter, type that instead of nomodeset, e.g. if you used i915.modeset=1, type the same in the Grub line). Press Ctrl + X to continue boot. Hopefully, you'll see the desktop this time. Once on the desktop, make sure you are connected to the internet. Now go to 'System > Administration > Hardware Drivers' (Lucid) or '> Additional Drivers' (Maverick) and check if any proprietary drivers are available for your graphics card. If there are any, activate the current/recommended one and the problem should go away forever. While doing a Wubi installation, you might not encounter a blank screen during the installation process, but once the installation is complete and you boot Ubuntu from the HDD you might notice the same. After selecting Ubuntu from the dual boot menu, you will automatically see the Grub menu. Edit the boot parameters and place "nomodeset" as described above. If there are no proprietary drivers available for your graphics card or if you prefer not to install them, you can make the nomodeset change permanent so you don't need to edit Grub every time you boot your computer. 4. Save and close this file. 5. Regenerate your '/boot/grub/grub.cfg' for the changes to take effect. 6. Done! Test it with a reboot. If you need to pop in this parameter in the Live CD environment, press F6 at the main boot menu but don't select "nomodeset" then. Instead, just press <Esc> after that and you'll see a boot parameter line at the bottom of your screen. At the end of that line, you can type any of the parameters to boot with those.